This is the end, for now. The bench is functional, and in position, and everything else will be put on hold for a little while while I recover. I’m not stopping, but I need a break from this to step back, be proud of what I accomplished, and then transition to the finishing stages. Don’t expect any immediate updates to this, but I will say when the project is done and completely finished. The bench is on what I refer to as a shakedown cruise. It’s basically done, now it’s time to refine and refresh. I will be checking the flatness and wind of the top soon, and I will probably use the router sled again to take care of anything, and finish it up with a card scraper. Dog holes will be added toward the front of the bench, and I will research just where I want them to line up. I’ll then hit the whole thing with a coat or two of BLO, and down the road when finances recover I will add the Vertias Twin Screw to the front left of the bench. I’m extremely happy with how it turned out, flaws and all. 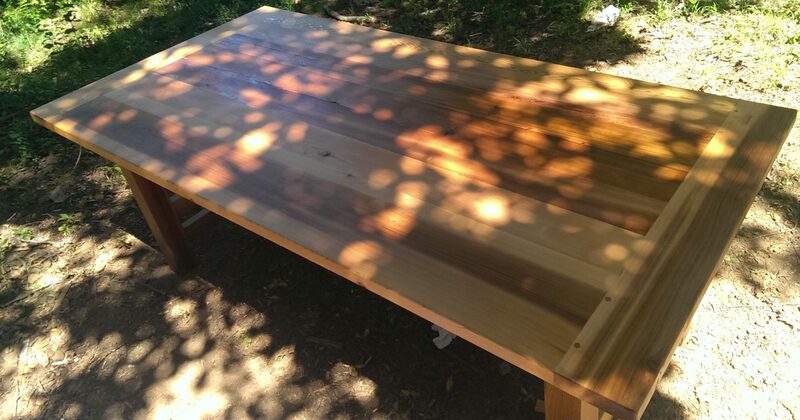 It measures 60″x24.5″, and is about an inch or 1.5″ below the surface of the table saw, which will work great to use the solid core door as an outfeed and assembly table. Even without using glue on the joints, it’s very solid and doesn’t move at all going along with the plane. It’s heavy, but it’s light enough that I can move it away from the wall easily. I’ve left the bottom open, as opposed to making a shelf for now, because I’m thinking of putting a 20-gallon separator under the bench, an ideal spot. There’s room under each end of the bench to store things, right now I’ve put a couple of things there out of the way but I will be investigating what I want at each spot. I took the Gramercy Holdfasts out of the box and treated them with a bit of 220-grit paper to help them stick in the dog holes a bit better. I tried out using them on a bit of the pine I had left over, and they work great. I have this old belt that I am going to donate some leather to the holdfasts so that they don’t scratch anything valuable. In the leg holes, they work great. I took a few trial passes with the #5 and it felt very secure. It was weird not having either the piece or the bench wobble as I was doing it. The legs aren’t perfectly square to the edge of the top, but it will work just fine. When I was installing the base, I think the left front tenon was too long, and drawboring it didn’t work. I could drill it out and do it again, but I’m fine with it for now. Just cosmetic, and if that changes it can be rectified. What follows are all the pics I took yesterday after a quick cleanup.